A KARATE ''instructor whose students will provide security for the Fleetwood Mac Australasian concert tour is to open a school in Blacktown. Bob Jones karate school will run each Monday and Thursday night at Blacktown High School. Bob Jones has been involved with karate for more than 15 years and his built hist talents into a highly profitable business. The Blacktown school will be run by Mr.Tom Slaven,an exponent of martial acts for more than 20 years. Mr Jones said his.schools placed strong emphasis on traaining women in seld-defence. 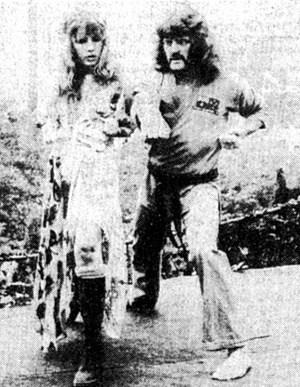 One of his best female students to date was Fleetwood Mac's lead singer, Stevie Nicks, who intended using some of the movements , she had learned as highlights in her acts. He also taught Australian actor Tom Oliver during a tour with ABBA. Mr Jones has made a lucrative business out of supplylng security for pop concerts and touring musicians. Among his CIients listed are Shaun Cassidy, Mick Jagger, Linda Ronstadt, David Bowie and ABBA. His technique is made up of a variety of Oriental styles which have been developed into a hghly successful format in America. Mr Jones has 120 karate schools throughout the country. Mr Jones said apart from the obvious benefits to women karate was an ideal discipline for Childrento learn. He says that children who have not performed formed well at school sports can usually improve their performance by studying karate. Mr Jones says it can also have a good influence on young trouble makers. These school bully and fighter types can learn to channel their energies into the martial arts and in some cases can take advantage of their ability by becoming tournament fighters.